Attention: Health conscious people of Penang and neighbouring states. 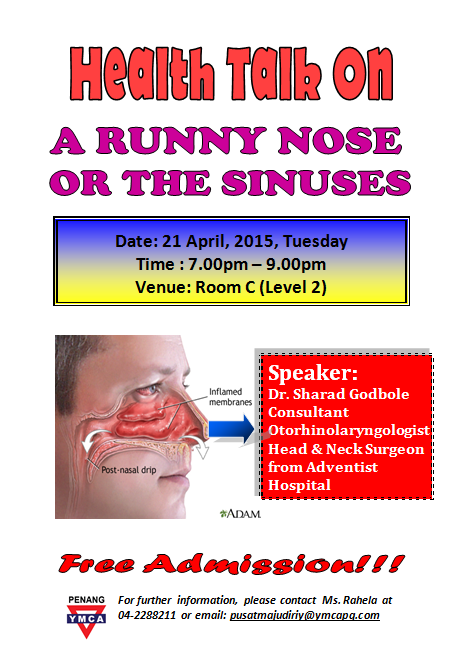 There will be a "Health Talk" on the topic "A Runny Nose or The Sinuses" delivered by Head & Neck Surgeon Dr. Sharrad Godbole of Adventist Hospital Penang at YMCA Penang (Room C, Level 2) at 7pm to 9pm on the 21st April, Tuesday. Its Free Admission and for further information please contact Ms Rahela at 04-2288211 or email pusatmajudiriy@ymcapg.com.